The Phoenix Project business simulation is a dynamic, classroom-based, interactive workshop. Players on a team are assigned roles and responsibilities and placed in a realistic environment in which they must effectively communicate and collaborate applying DevOps practices and principles to succeed. The simulation is played in a number of rounds. At the end of each round, the team must demonstrate performance improvements relating to number of deployments, successful deployments, resolution effectiveness and business value realized. Between simulation rounds, the team learns to reflect and apply continual improvements. In one of the three teams, we piloted the DASA Competence model assessment between game rounds to help the team assess their skills and knowledge and to enable them to shape and agree on improvements. This is just like Daily Work! In the first simulation round the team recognized ‘Chaos.’ There was little insight into what people were working on; very little insight into the work being done; expected business outcomes were not being met; testers had no insight into what needed testing or were called in too late; the business had little insight into the status of business initiatives; mistakes were made due to lack of information; work was taking too long; teams were working in Silos…..’I thought we were here to learn’ said one manager ‘This is just like daily work’! 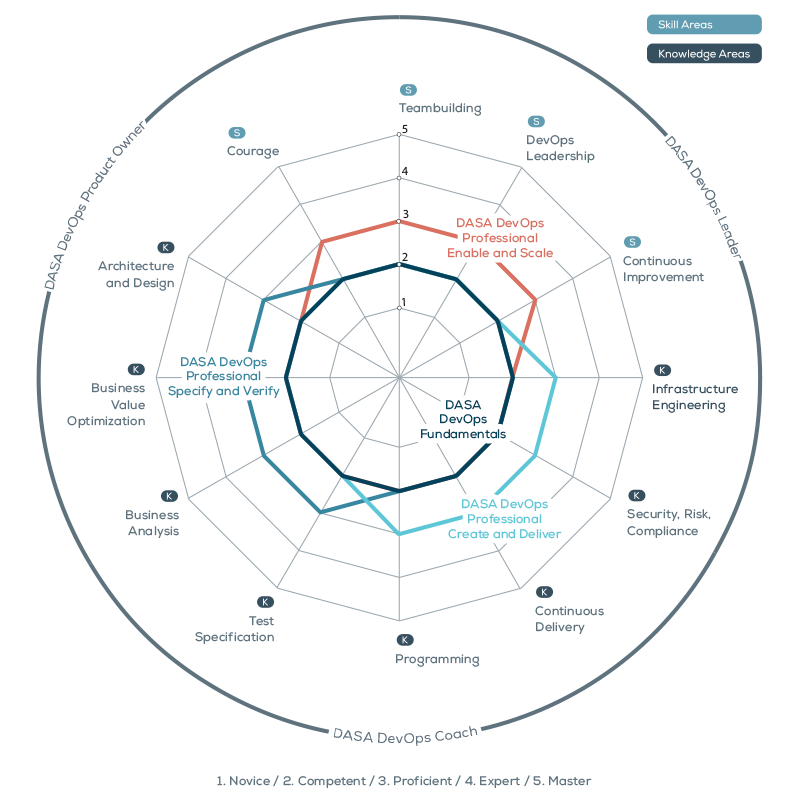 At the end of the round we used the DASA Competence Model which looks at 4 key ‘Skills & Behavior Areas’ and 8 ‘Knowledge Areas’ that are critical for DevOps success. In the DASA assessment, each of these 12 Components is broken down into many ‘dimensions.’ Each dimension is explored in 5 Levels of ability from Level 1: ‘You take actions with a limited understanding of the consequences and possible mitigations. There is little trust between team members’, through to Level 5: ‘Experimentation is based on an agreed risk-reward mechanism that the team has integrated into its way of working. The team is self-confident in its ability to deliver value to its customers through its way of working and proactively shares its experiences and lessons learned’. Courage is about the ability to act, to step up and try something. While at the same time understanding the impact and consequences and mitigate potential threats. Consciously applying the method of experimenting and having the courage to do so (‘be a Columbus’). Team building is the skill to ensure that all team members work together in an effective way to deliver maximum value to the customer. The team was hierarchic with managers deciding everything, and there was little initiative, lack of trust and people ‘waiting to be told what to do’. The team decided to remove the hierarchy, all members were equal in the stand-up and shared all relevant information (such as business & IT strategic goals and ambitions), and all gave feedback. The team decided to experiment with single piece flow to ensure the flow worked smoothly and to identify constraints and forms of waste. The team introduced the concept of calling ‘stop’ when the flow wasn’t working, where there was waste or where the business outcome was threatened. Resulting in more trust, people taking ‘ownership’ and taking more initiative. This also stopped them failing and impacting the business results. Degree in which the team has identified, shared and committed themselves to shared goals / common purpose. At the start of the simulation team members were working in SILOs, trying to achieve own goals, not sharing information and had no apparent common priority mechanism which caused failures, delays with significant work and stress with trying to do too much. The team decided to engage more with the CEO and focus on agreeing with the business the strategic goals, and a priority mechanism for balancing ‘value’ and ‘outcomes’ of new features, as well as ‘costs’ and ‘risks’ of technical debt. Prioritization would be based on business impact. Helping the team focus on doing the right things, wasting fewer resources, causing less stress and improving business results. Personal Leadership is your skill to act as a role model towards colleagues. It means encouraging collaboration and ensuring that you and your team keep sight of the ultimate goal to deliver business value. Motivating and challenging others to perform autonomously as a professional. In the beginning, managers did not ‘Trust’ and were continually disrupting people and asking for updates and telling people what to do, wasting time and demotivating team members. The team agreed on clear responsibilities and a way of working, and recorded on a flip-over ‘Team rules of collaboration.’ Everybody was allowed to call ‘Stop’ when they saw things were not working – without any blame! Team members showed they understood business goals and gave each other feedback. Creating more trust resulting in less waste from waiting for managers to disrupt people to control what was happening realized by using a Visual Management board to provide transparency. Continuous Improvement means having a mindset focused on seeing and solving problems/impediments, combined with the skill to solve them in a structured way. Behavior in which people state their intention to improve, are transparent, continuously look for new opportunities to improve and measure and communicate success. In the beginning, the team was chaotic; process flow was unclear, too little information, no shared purpose – in fact, the team was displaying many of the characteristics of Level 1 in the assessment areas. There was no visibility or transparency in these issues, so they kept happening. The team decided to record on a flip-over (visualize and make transparent), issues in the way of working to be used at the next team reflection moment. Such as ‘Unclear how to prioritize between feature and technical debt,’ the VP IT Ops recorded ‘Unclear what people are working on,’ testers recorded ‘need to be involved earlier and gain full insight.’ During the stand-up between game rounds, the team conducted an improvement session and prioritized and agreed on key improvements from the list’. Business Value Optimization means using the knowledge of the business, your customers, and their processes, to help to identify those improvements that add the most value to customers and the organization. The team also explored the knowledge area of ‘Business Value Optimization,’ and the ‘dimensions’ of ‘Understanding organizational goals’ and ‘Stakeholder management.’ They actively engaged with the CEO to understand goals as they related to business revenue, business growth, employee satisfaction, and Customer experience’. Also how to prioritize these against the knowledge area ‘Security, Risk and compliance’ and the dimension ‘Management of risks,’ looking at the impact on share price, damage to image and reputation. After applying the improvements, the teams played the next round. The team that used the assessment outperformed the other two teams by more than 30% in revenue growth and share price and reported less damage from downtime. Common Purpose: Focusing on ‘Business Value Optimization’ helps create a clear insight into business strategy and goals. It helps answer the ‘Why’ question which motivated people and empowers them to prioritize when resources are scarce. Personal Leadership: Everybody must take Ownership, business (Product owner) & IT, are enabled by providing a shared purpose, a culture of no blame, and by fostering a culture of feedback. This will also create more trust and openness. Experimentation: Forget the org chart. Flexibility is key. Short communication lines. Clear decision-making authority results in more effectiveness and efficiency. Courage: Calling ‘Stop’ – direct feedback to prevent passing errors downstream and to identify immediate areas for workflow improvement. Coupled with a ‘no blame’ culture. Transparency: Dashboard visualization. Visualizing the work in progress, WIP limits, Business Value to be realized, Business realization. Also imagining improvement actions. The teams should develop visualization. Developing and using this helps foster open communication and feedback when building and using. Test Engineering: Integrating testing as early as possible to help prevent passing errors downstream and raised the importance of testing as a means of direct feedback. Different IT units selected several projects (proposed and already started) to be split into smaller parts to deliver faster and earlier results, thus quicker and earlier business value. The team agreed to share experience and lessons learned. Moving away from traditional and monolithic development to a more agile approach was a key finding. Various IT units already had experience with agile methods and they agreed to share these with all others to facilitate and support them. The need for visualization and transparency was a key finding during the games. All players agreed to create something for their daily work and teams. Again, they agreed to share knowledge and experience to avoid multiple efforts and having the wheel invented numerous times, but still, let every team decide their way of creating transparency. To further support transparency they decided to have more short meetings like a daily stand-up. The leadership team agreed to encourage, support and continuously ask for more feedback on all layers of their organization. The value of knowledge sharing and building T-shaped profiles was another critical finding and seen as a prerequisite to keep teams at an acceptable size and get more valuable feedback. The group agreed to implement the 3:1 & 1:3 rule wherever possible. The top management team (CIO and direct reports) committed to initiate a discussion with the business units to improve the description and communication of business value and benefits from projects, thus facilitating the prioritization of tasks and activities inside IT and enable the business value focus. You can see in this small example. 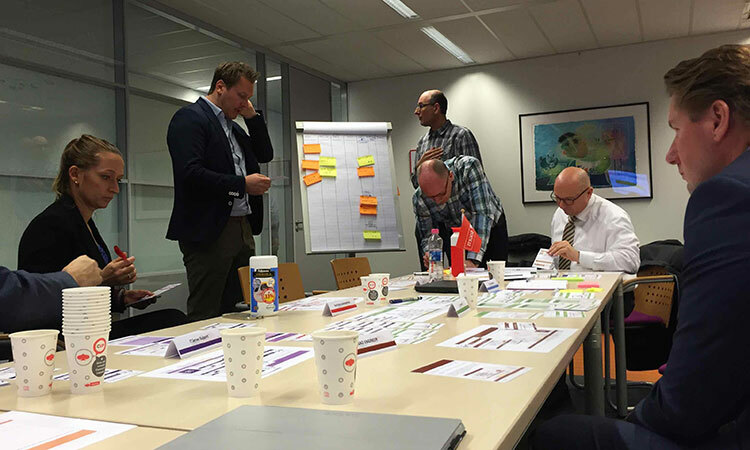 The DASA Competence Model and the assessment, even in this short exercise helped the team assess and agree on improvements focused on realizing business value, rather than realizing code features and deployments. At the same time experiencing the impact of using it in a simulated environment helped create buy-in and commitment to take the learning points away as part of an improvement plan. Find more examples of essential learning takeaways from using the simulation about the DASA competence model.